In the Northwest, brides have been coveting locally-sourced blooms in wedding arrangements for years; now comes the latest member of the locavore movement—the “farmer florist.” Today, this growing group of florists inspires a personal connection with couples looking for one-of-a-kind arrangements by sourcing local and seasonal flowers from their own farms. The details: Bridal bouquets start at $175; bridesmaid bouquets start at $95; boutonnieres start at $15; lush garden centerpieces start at $75; will deliver to venue. 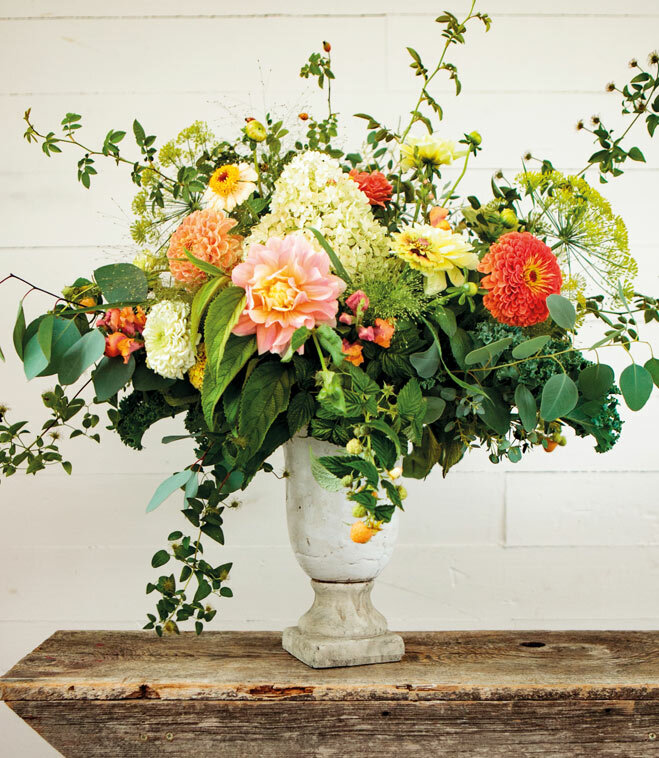 Floral designer Kelly Sullivan of Botanique specializes in lush, textural and seasonally inspired arrangements with lots of movement. Blooms not grown in the Seattle-based floral design studio’s 800-square-foot cutting garden in South Seattle are sourced from the Seattle Wholesale Growers Market and local farmers. “What we grow is dictated exclusively by what we love and what we can’t get elsewhere,” says Sullivan. Since Sullivan operates with limited space, flowers are grown for specific purposes, rather than in large quantities of any given flower type. The captivating arrangements designed by Botanique incorporate soft, full, multi-petaled blooms, such as garden roses, dahlias and tons of vine foliage. The details: Pricing varies greatly depending on size of the wedding; full-service weddings usually start at $3,500; will deliver to venue. With a floral aesthetic that is decidedly inspired by cottage gardens, Triple Wren Farms creates arrangements in a natural, organic style that is fairly wild yet still composed. Located in the heart of a beautiful U-pick apple orchard just outside of Bellingham, the 22-acre salmon-safe and American Grown–certified flower farm grows more than 100 varieties of bountiful blooms; expect unique elements such as seed pods, trailing amaranth, rich chocolate cosmos, and cherry rudbeckia. Enroll in its “Buy-the-Bunch” program to reserve DIY blooms for your wedding date (subject to availability), ideal for brides who want to have a hand in the flower arranging. DIY flowers are harvested the week of your wedding for pickup prior to your event. To make sure everything goes seamlessly, book an afternoon to practice the skill at the farm with co-owner Sarah Pabody prior to the big day. The details: Buy-the-Bunch orders start at a $350 minimum, which covers the bride’s bouquet, 3–4 bridesmaids bouquets, 3–4 boutonnieres or corsages, plus a few extra arrangements for the ceremony or reception. The farm also offers custom-designed arrangements and delivery services. With a quaint shop located in Melrose Market and a floral studio located within The London Plane in Pioneer Square, Marigold and Mint is known for its loose, romantic aesthetic. Formerly a landscape architect, owner Katherine Anderson started the organic 2-acre farm situated alongside the Snoqualmie River in 2008, specializing in locally procured arrangements guided by color and form. Anderson’s designs tend to incorporate timeless blooms such as peonies, ranunculus, and sublimely scented specialty dahlias, as well as unusual elements, such as berries plucked before ripening. The details: Arrangements average $50, but can vary depending on the pricing of the total order; will deliver to venue. 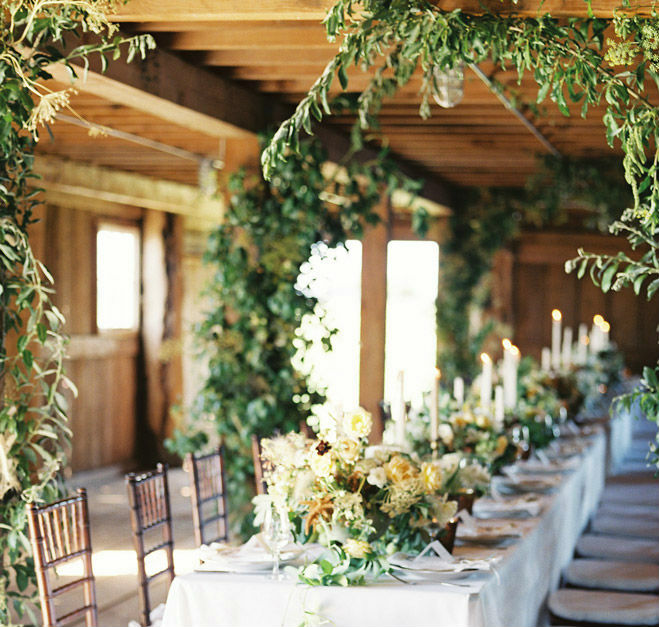 Drawing inspiration from nature, such as the shape of a branch or the way a flower is bobbing in the breeze, Country Bouquets Floral owner Kelli Walker can transform a venue with seasonal and fresh flowers that look as though they were just picked from her Skagit Valley garden. 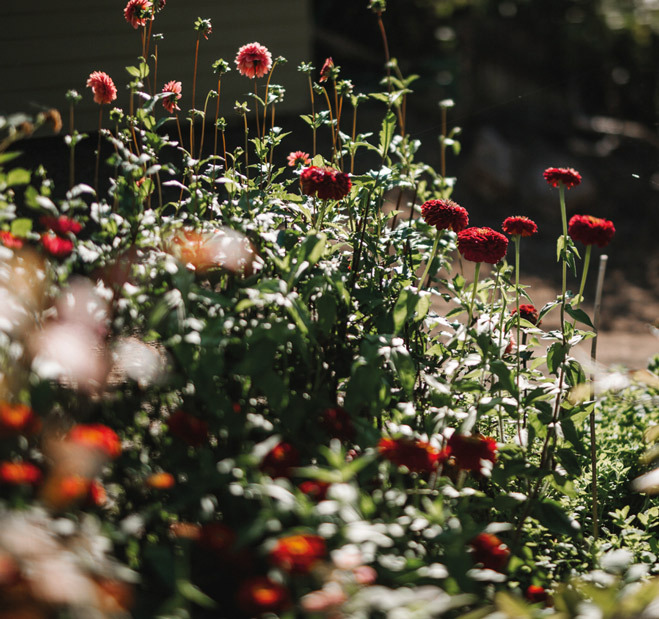 Walker has lived in her home for nearly 20 years, and her gardens are well-established. Bouquets typically are loose in style, hand-tied with ribbon streamers and often are composed of snowbells, species lilies, love-in-a-mist and sweet-pea vines. For added texture, Walker uses fragrant herbs, growing sage, mint, oregano and basil just for this purpose. The details: Fees start at $1,000 for smaller weddings and average around $2,500 for larger celebrations; will deliver to venue. 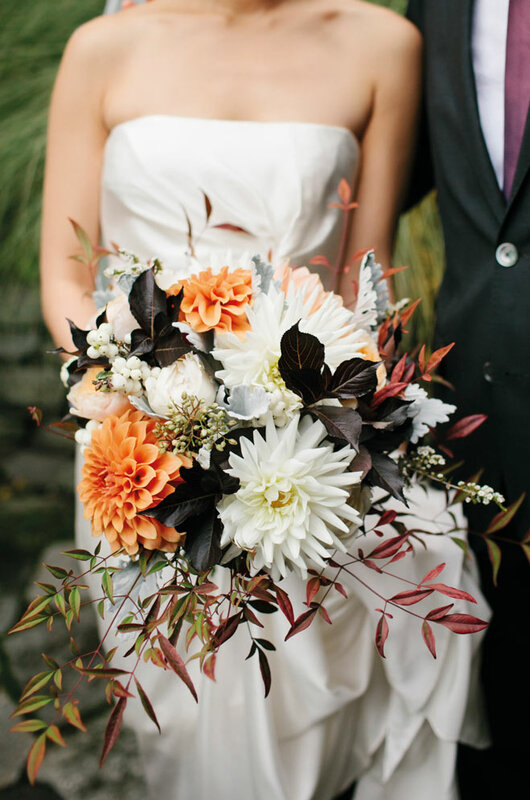 Festoon the groom with a creative boutonniere inspired by the natural hues of autumn. This fresh trend has a rich history. After a long, grey winter, spring is right around the corner! One of our favorite things about spring is the florals that bloom and colors that they bring.